Hedge fund ValueAct is taking a big stake in Microsoft. "We see Microsoft's consumer strategy challenges and say who cares," said Ubben, speaking Monday at the Active-Passive Investor Summit in New York. Microsoft has seen its Windows franchise take a big hit along with declining PC sales. But Ubben sees growth opportunities. Microsoft provides the plumbing that helps large and small businesses function, he explained. While many have derided Microsoft's inability to innovate, Ubben said that's not such a bad thing. "IT managers don't want constant change." Microsoft should continue to capitalize on new enterprise businesses, such as instant messaging application Lync and web portal service SharePoint. Those software applications are what Microsoft does right and should continue to do. 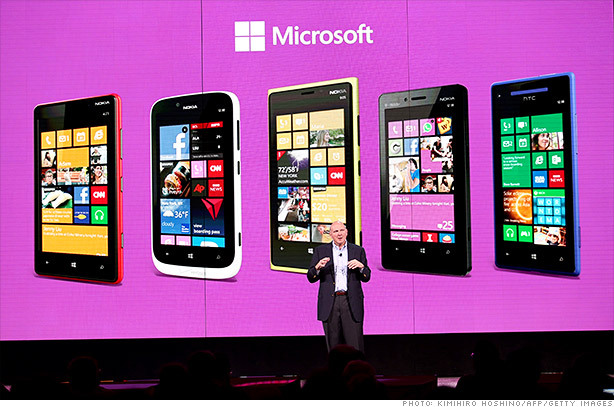 "Microsoft is not good at consumer devices, but that's not the relevant lens to view the company," he said. Microsoft's stock has been "left for dead," he said, mostly because of declining PC sales. "The valuation is stupid now." Ubben wouldn't say whether he would seek to shake up Microsoft's management or board. He also wouldn't comment about CEO Steve Ballmer's performance. ValueAct typically works with corporate boards in private. The changes Ubben is pushing for seem to be operational. Windows might have made Microsoft what it is today but it's not the future of the business he calls a "national treasure." "Microsoft must consider strongly in the not too distant future making Office available outside Windows," he told attendees at the summit. Renowned bear investor Jim Chanos called Hewlett Packard (HPQ) "the ultimate value trap." Chanos outlined his vision of how the inevitable death of the personal computer will affect the broader technology industry, but said Hewlett Packard was the company most precariously perched on the edge of obsolescence.